Starting with the February 1937 issue of Flying Aces, Alden McWilliams began his illustrated tribute to the pioneer aviators of that era. He called it “They Had What it Takes”. It appeared in each issue of Flying Aces until June 1940. 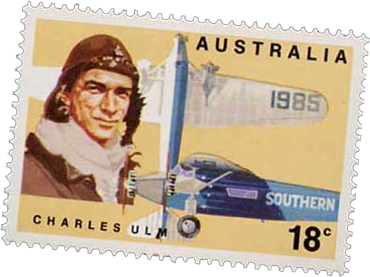 Part 27 apeared in the April 1939 issue and featured Another great Austrailian Air Pioneer—Charles Thomas Philippe Ulm! Ulm is probably best known for his association with Sir Charles Kingsford-Smith who was covered by McWilliams two years earlier. He was Kingsford-Smith’s copilot on many of his famous flights including the 1928 first crossing of the Pacific in the Southern Cross. And together they founded Austrailian National Airways.